Edwin George Morgan OBE FRSE (27 April 1920 – 17 August 2010) was a Scottish poet and translator who was associated with the Scottish Renaissance. He is widely recognised as one of the foremost Scottish poets of the 20th century. In 1999, Morgan was made the first Glasgow Poet Laureate. In 2004, he was named as the first Scottish national poet: The Scots Makar. Morgan was born in Glasgow and grew up in Rutherglen. His parents were Presbyterian. As a child he was not surrounded by books, nor did he have any literary acquaintances. Schoolmates labelled him a swot. He convinced his parents to finance his membership of several book clubs in Glasgow. The Faber Book of Modern Verse (1936) was a "revelation" to him, he later said. Morgan entered the University of Glasgow in 1937. It was at university that he studied French and Russian, while self-educating in "a good bit of Italian and German" as well. After interrupting his studies to serve in World War II as a non-combatant conscientious objector with the Royal Army Medical Corps, Morgan graduated in 1947 and became a lecturer at the University. He worked there until his retirement as a full professor in 1980. Morgan described 'CHANGE RULES!' as 'the supreme graffito', whose liberating double-take suggests both a lifelong commitment to formal experimentation and his radically democratic left-wing political perspectives. From traditional sonnet to blank verse, from epic seriousness to camp and ludic nonsense; and whether engaged in time-travelling space fantasies or exploring contemporary developments in physics and technology, the range of Morgan's voices is a defining attribute. Morgan first outlined his sexuality in Nothing Not Giving Messages: Reflections on his Work and Life (1990). He had written many famous love poems, among them "Strawberries" and "The Unspoken", in which the love object was not gendered; this was partly because of legal problems at the time but also out of a desire to universalise them, as he made clear in an interview with Marshall Walker. At the opening of the Glasgow LGBT Centre in 1995, he read a poem he had written for the occasion, and presented it to the Centre as a gift. In 2002, he became the patron of Our Story Scotland. At the Opening of the Scottish Parliament building in Edinburgh on 9 October 2004, Liz Lochhead read a poem written especially for the occasion by Morgan, titled "Poem for the Opening of the Scottish Parliament". She was announced as Morgan's successor as Scots Makar in January 2011. Near the end of his life, Morgan reached a new audience after collaborating with the Scottish band Idlewild on their album The Remote Part. In the closing moments of the album's final track "In Remote Part/ Scottish Fiction", he recites a poem, "Scottish Fiction", written specifically for the song. In 2007, Morgan contributed two poems to the compilation Ballads of the Book, for which a range of Scottish writers created poems to be made into songs by Scottish musicians. Morgan's songs "The Good Years" and "The Weight of Years" were performed by Karine Polwart and Idlewild respectively. Nobel Laureate Seamus Heaney "[paid] formal homage" during a 2005 visit. In later life Morgan was cared for at a residential home as his health worsened. He published a collection in April 2010, months before his death, titled Dreams and Other Nightmares to mark his 90th birthday. Up until his death, he was the last survivor of the canonical 'Big Seven' (the others being Hugh MacDiarmid, Robert Garioch, Norman MacCaig, Iain Crichton Smith, George Mackay Brown, and Sorley MacLean). On 17 August 2010, Edwin Morgan died of pneumonia in Glasgow, Scotland, at the age of 90. The Scottish Poetry Library made the announcement in the morning. Tributes came from, among others, politicians Alex Salmond and Iain Gray, as well as Carol Ann Duffy, the UK Poet Laureate. First Minister of Scotland Alex Salmond's leader's speech to the Scottish National Party Conference at Inverness on 22 October 2011 referred to Morgan's bequest of £918,000 to the party in his will as "transformational". The next day it was announced that all of the bequest would be used for the party's independence referendum campaign. Morgan also left £45,000 to a number of friends, former colleagues and charity organisations and set aside another £1 million for the creation of an annual award scheme for young poets in Scotland. Poetry by Edwin Morgan inscribed on the pavement on Candleriggs, Glasgow. Morgan worked in a wide range of forms and styles, from the sonnet to concrete poetry. His Collected Poems appeared in 1990. He has also translated from a wide range of languages, including Russian, Hungarian, French, Italian, Latin, Spanish, Portuguese, German and Old English (Beowulf). Many of these are collected in Rites of Passage. Selected Translations (1976). His 1952 translation of Beowulf has become a standard translation in America. Morgan was also influenced by the American beat poets, with their simple, accessible ideas and language being prominent features in his work. In 1968 Morgan wrote a poem entitled Starlings In George Square. This poem could be read as a comment on society's reluctance to accept the integration of different races. Other people have also considered it to be about the Russian Revolution in which "Starling" could be a reference to "Stalin". The Death of Marilyn Monroe (1962) – an outpouring of emotion after the death of one of the world's most talented women. The Billy Boys (1968) – flashback of the gang warfare in Glasgow led by Billy Fullerton in the Thirties. In the Snackbar – concise description of an encounter with a disabled pensioner in a Glasgow restaurant. 2007 T. S. Eliot Prize for A Book of Lives. ^ a b Professor Edwin Morgan: Writer celebrated as one of the finest Scottish poets of the 20th century, The Independent. ^ a b Crown, Sarah (26 January 2008). "Zest and grit". The Guardian. Guardian Media Group. Retrieved 26 January 2008. ^ Gardner, Raymond (26 April 1980). "Glasgow's Galactic Bard". The Glasgow Herald. p. 9. Retrieved 23 July 2017. ^ McGonigal, James (2006). "Gay Writing in Scotland: An Interview with Edwin Morgan". In McGonigal, James; Stirling, Kirsten (eds.). Ethically Speaking: Voice and Values in Modern Scottish Writing. Rodopi. pp. 139–56. ISBN 90-420-2084-9. ^ "Liz Lochhead confirmed as new Scots Makar". BBC News. BBC. 19 January 2011. Retrieved 19 January 2011. ^ a b c d Flood, Alison (19 August 2010). "Edwin Morgan, Scotland's national poet, dies aged 90". The Guardian. Guardian Media Group. Retrieved 19 August 2010. 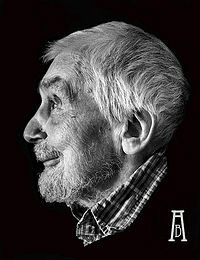 ^ a b "Obituary: Edwin Morgan". The Daily Telegraph. Telegraph Media Group. 19 August 2010. Retrieved 19 August 2010. ^ Scotland's national poet Edwin Morgan dies aged 90, STV. ^ "In quotes: Edwin Morgan tributes". BBC News. BBC. 19 August 2010. Retrieved 19 October 2010. ^ SNP. "Alex Salmond delivers keynote speech". Archived from the original on 25 October 2011. Retrieved 24 October 2011. ^ Robertson MP, Angus (24 October 2011). "SNP reveals route in independence". Scotsman. Retrieved 24 October 2011. ^ "Edwin Morgan stuns party bosses". Daily Record. 19 June 2011. Retrieved 22 October 2011. ^ a b Scott, P. H. (2005). Spirits of the Age: Scottish Self Portraits. Edinburgh: Saltire Society. p. 33. ISBN 0-85411-087-9.